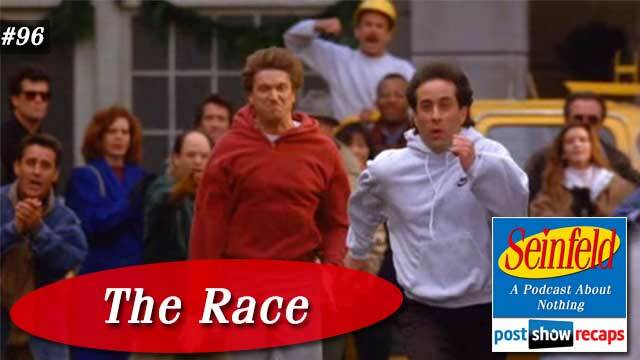 Rob Cesternino and Akiva Wienerkur chose to podcast this week about Seinfeld, bringing you the recap of “The Race”, which first aired December 15, 1994 as part of season six. The episode was written by Gammill, Pross, LD and Sam Kass. News – Though he didn’t have hard news to share, Akiva wanted to talk about a tweet of Jerry’s from this past week where he said if Jerry and George were cool, it would have ruined the show. Akiva argued he always thought Jerry was cool. Jerry’s story – Jerry’s new girlfriend Lois’ boss is Jerry’s arch nemesis Duncan from high school, who is still sore about Jerry beating him in the 9th grade race. Jerry and George reveal to Elaine that Jerry actually jumped the gun, but he’ll never admit it to Duncan. He and George devise a plan to have George pretend to bump into Jerry and Duncan and confirm that Jerry did not cheat at the race, which ends up not quite working. When Duncan threatens to fire Lois if Jerry doesn’t redo the race, he finally agrees. At the race, Kramer’s car backfires right before the race starts, so Jerry jumps out ahead once again, winning the race. George’s story – George notices some personal ads in the Communist newspaper Elaine’s boyfriend Ned is reading. When his secretary overhears him talking to one of the ladies, she tells on him to Steinbrenner. Steinbrenner is actually happy about this, as it gives the Yankees an opportunity to scout Cuban baseball players, sending George to go meet with Fidel Castro. Castro likes George as well, and gives him full access to any of their players. Elaine’s story – Elaine starts off the episode getting banned from having delivery from Hop Sing Chinese Food for complaining about her order. She is dating a man named Ned who turns out to be a Communist, which intrigues Elaine. She does try to up Ned’s wardrobe from the drab attire a Communist wears. Things end up sour with Ned when Elaine gets him banned from Hop Sing, which was the restaurant his Communist father used to spend all day in after being black listed decades ago. Kramer’s story – Mickey has landed Kramer a job as a mall Santa for the holidays. On his first day, Ned starts feeding Kramer Communist propaganda, which Kramer in turn stars preaching to the kids visiting. One of the kids shouts out that he’s a commie, leading to the mall manager firing him. 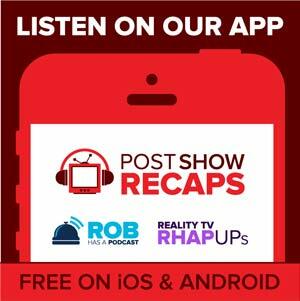 Rob and Akiva tangents – The guys started the show discussing how neither of them love running so much, though they both dabble. They talked about how Ned is fine to be a Communist for Elaine, just as long as he is pro choice. Akiva had a lot of questions about the mall Santa that Rob was able to fill him in on. Rob also explained what homeroom was in school, and how Rob didn’t attend much since he used to read the school’s morning announcements. What doesn’t work in 2016 – In 2016, the relations with Cuba have thawed considerably. Also, someone would have videotaped the race on their phone, allowing Duncan to prove Jerry jumped early. Jerry, George and Duncan would probably be Facebook friends, so George couldn’t pretend to bump into them after 20 years. Grades and Ranking – Both the guys agreed that Jerry’s story deserved an A, as well as George’s. Akiva got Rob to agree that Elaine’s story was deserving of a B+. They disagreed on Kramer’s grade, with Akiva giving him a B-, while Rob thought it was definitely the weakest story, earning a C. Akiva thought this was the best episode of season six so far, slotting it at 17, with Rob agreeing that it’s an underrated episode. Emails – David emailed in to share that he’s listened to the all Seinfeld Post Show Recaps 11 times over. He shared how he loves that Akiva has a better microphone than in the beginning, and how the podcasts improve with each episode. Colin the delivery guy remarked about how all the business owners in Seinfeld are quick to ban customers. Colin added that the pizza place he works at has banned customers, but only in extreme circumstances. Andrew, Akiva’s childhood friend wrote in to comment on how great the soup countdown was, adding how a young Akiva once told his mother she made a poor excuse for a matzo ball. Lindsay emailed in to ask what the 2016 equivalent would be to Elaine dating a communist. Akiva and Rob thought a conspiracy theorist or the Illuminati would correlate. Dan the benefactor noted how George could have bridged the gap with Cuba in order to bring in El Duke` a few years later. Craig from Vancouver added that the phase “I choose not to run” was derived from Calvin Coolidge. Travis noted that Kramer’s ideas for deli meat classification poses a problem for Rob and Akiva’s drive to rename bologna to American salami. Amir wondered why Ada would tell Steinbrenner about George being a communist when she could be putting her job in danger after having slept with him. Harry saw that several of the names on the Hop Sing banned list are made up of random cast and crew from Seinfeld. Lastly, Chester wanted to know how Jerry would pull off fooling Lois, pretending to not know George, when they have hung out every day for years. As an aside, Johnny De Silveira answered their question from last week when Rob asked him to ding, marry, kill his favorite three podcasts. He said he’d ding House of Cards, marrySeinfeld, and kill SNL. Tune in next week as the guys will recap “The Switch”. Send in your questions by emailing[email protected]. Don’t forget to subscribe to the podcast by going to postshowrecaps.com/seinfeldITunes where you can rate and review the podcast. You can get a discussion going about the podcast by leaving a comment on the show page, and as always, you can follow them on Twitter @robcesternino and @keev26.